Fenugreek And Breast Milk Supply – Does It Help? 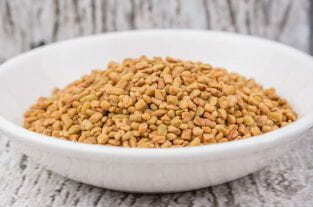 Fenugreek is enjoyed as a culinary herb and spice in many parts of the world such as France, India, Argentina, North Africa and the Mediterranean countries. Fenugreek has also been used for centuries as a galactagogue – a substance claimed to increase milk supply. Even today, fenugreek is probably the most common plant used as a galactagogue. When taken to help boost milk supply, fenugreek is used as ground seed – in capsule form, or in tea. Some mothers say they find fenugreek helps increase their milk supply. However, what does the scientific research say about fenugreek’s efficacy as a galactagogue? Is it safe, and should it be the first line of treatment to increase milk supply? Most of the research about fenugreek and breast milk production is anecdotal. What this means is some women have found fenugreek to be helpful in increasing milk supply. However, there is a lack of scientific research to back up what some mothers have found. There have only been a limited number of studies about fenugreek as a galactagogue. Most of these studies are of low to moderate quality and most didn’t find fenugreek to be effective in increasing milk supply. Lack of randomisation. The most important aspect of randomisation is that it helps ensure participants are objectively representative of the group being studied. If this doesn’t happen, it increases the risk of bias in the participant selection process. For example, if mothers who are very motivated to breastfeed and take fenugreek capsules are compared with mothers who take a placebo capsule yet are less motivated to breastfeed, then this will obviously affect the results. Randomisation helps prevent such an occurrence. Lack of placebo control group. Without a placebo group for comparison, it’s more difficult to know whether the treatment being studied has any effect. It’s possible for participants to have a treatment effect due to other factors, such as knowing they are receiving a treatment, attention from health professionals, and the expectations of a treatment’s effectiveness by those conducting the research study. In some studies, fenugreek was part of a mixture given to mothers. As a result, no single ingredient could be considered solely responsible for the mixture’s effects. Small number of study participants. The small number of participants in a study affects its reliability. Reliability refers to how consistently the study outcomes are repeated in a group of people. More well designed human research trials are needed before fenugreek’s potential efficacy as a galactagogue can be established. Although more research is needed, if a mother wishes to try fenugreek to increase her supply, is it safe for her to do so? Fenugreek is considered safe for breastfeeding mothers, when used in moderation, and “generally recognized as safe” by the US Food and Drug Administration. Leading breastfeeding researcher, Doctor Thomas Hale, classifies fenugreek in the Lactation Risk Category L3, which means moderately safe. Peanut or chickpea allergy. Fenugreek is in the same family as these and possibly other legumes. Therefore fenugreek can cause an allergic reaction in mothers who have an allergy to these foods. Diabetes. A typical dosage of fenugreek used as a galactagogue is 1-6 grams daily. With dosages higher than this (25 grams or more daily), fenugreek can cause lowering of cholesterol and blood sugar levels. It can also interact with warfarin and cause bleeding. If you have diabetes or take warfarin, you should exercise caution in taking higher dosages. Asthma. Some mothers have reported that fenugreek worsened their asthma symptoms. When trying to increase supply, in almost all cases, you should try non-pharmacological methods first. The first thing to determine, if you feel you need to increase supply, is to work out whether your supply really is low. To work out your supply, you should use the reliable signs of your baby’s milk intake and not the unreliable signs. Having a skilled breastfeeding expert, such as a lactation consultant, watch a breastfeed. If you feel your milk supply is low, it’s important to seek assistance. For example, a breastfeeding support organisation such as the Australian Breastfeeding Association or La Leche League can help. Seeing a lactation consultant might also be useful. If your milk supply really is low, despite milk being removed well and often, fenugreek might help. To be safe, it’s always important to seek medical advice before taking any pharmacological substance.